Claggett stands victorious with team Teofista after his successful defense of his NCC belt. Earlier today, the National Championship Committee (NCC) announced its decision to strip Canadian welterweight champion Steve (The Dragon) Claggett of his Canadian title. 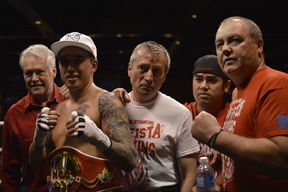 The announcement comes just three days before Claggett (22-3-1, 15 KOs) is set to take on Stuart McLellan (12-1-3, 3 KOs) for the vacant Canadian Professional Boxing Council (CPBC) belt during Teofista Boxing Series 17. The revoking of Claggett’s title eliminated the possibility for a title unification for the young Calgarian. Although the announcement was just made today, Claggett’s trainer Eric De Guzman said that they were aware of the loss of the title well ahead of time. “Steve was actually stripped a long time ago,” said De Guzman. He believes that the NCC decided to make the announcement today because of its relevance to his upcoming fight. De Guzman said that the decision to strip Claggett of his title was due to the fact they had declined to pay the NCC a sanctioning fee to formally recognize the fight. De Guzman explained that the NCC used to have an affiliation with the World Boxing Council (WBC), one of the largest sanctioning bodies in boxing. With that affiliation, any fighter to win the NCC title would automatically receive a ranking in the WBC’s top 20. However, as of a few years ago, they lost that affiliation, so paying the sanctioning fee would allow a fighter to retain their title, but wouldn’t result in an international rank. More recently, the CPBC struck a deal with the World Boxing Association (WBA) and the North American Boxing Association (NABA) that allows for any CPBC title holder to receive a rank in the WBA’s top 40. “[CPBC president Don Collette] has the connections to get us ranked by the WBA. That, in my mind, is worth spending the sanctioning fees on,” said De Guzman. “When I win this fight—let’s say ‘when’ because I’m a true believer in summoning what you want into reality—when I win this fight on Friday night, they’re going to put me in the rankings for the WBO,” Claggett said. “This is something that I was talking to people about today, everyone’s saying ‘oh, you got stripped of your title, isn’t that-’ I didn’t get stripped of my title, I walked away from it because we have got to make the right moves for my career,” said Claggett. Claggett and McLellan face off Friday Sept 18, at 7 p.m. at the Deerfoot Inn and Casino. Also on the card, Calgary’s own cruiserweight Jordan (The Hitman) Smith (3-0-1, 1 KO) will fight Taylor Bull (2-4-0, 2 KO’s), Connor Bush (1-0-1, 1 KO) is set to take on Brett Enns (2-0-0, 0 KOs), Roxie Lam (5-1-0, 3 KOs) battles Robert Nelson in his professional boxing debut, and Alex Torres Rynn (1-0-0, 0 KOs) will face off against Dave Aucoin (3-13-0, 1 KO). Doors open at 7 p.m., visit www.teofista.com, or get your tickets at the door.